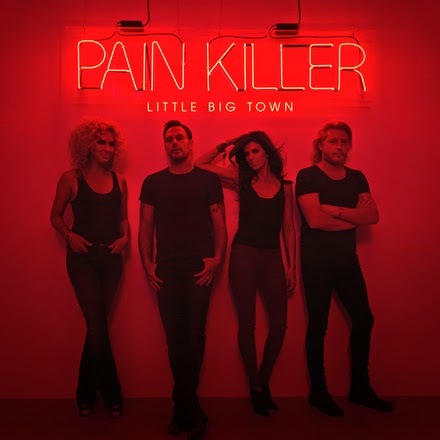 NASHVILLE TN (Monday, August 25, 2014) – GRAMMY award-winning country group Little Big Town—consisting of members Karen Fairchild, Jimi Westbrook, Phillip Sweet, and Kimberly Schlapman—will be launching THE PAIN KILLER TOUR on November 8, 2014 in Youngstown, OH. Today the foursome also unveiled the album cover of Pain Killer, their upcoming sixth studio release, on the band’s Instagram page (instagram.com/littlebigtown). Pain Killer is set for release October 21st and features current hit single, “Day Drinking.” All tour dates except Mt. Pleasant, MI will be produced by AEG LIVE/The Messina Group. THE PAIN KILLER TOUR will feature special guests Brett Eldredge and Brothers Osborne and will hit over 13 cities nationwide, wrapping in Rockford, IL on December 13th. "The band is so stoked about this record that we've been playing new songs all summer," added Westbrook. "We can't wait to play the whole thing, along with our hits the fans know and love this November." For the very first time the band is offering their fans a unique VIP experience on THE PAIN KILLER TOUR. Choose from 2 limited packages including meet and greets, pre-show soundcheck, exclusive merchandise, and more. For more information on all VIP packages and pre-sale tickets head over to www.littlebigtown.com. Brothers Osborne hail from Deale, Maryland; a water town on the Chesapeake Bay. Upon moving to Nashville, Brothers Osborne began writing and playing every open-mic in town that they could. In 2012 the brothers signed to EMI Nashville (part of the Universal Music Group Nashville). Brothers Osborne mark the first duo signed to the EMI Nashville imprint. Their current single at country radio is the feel-good song "Rum," a song that the New York Times says "…is elegantly structured, sinewy country passing as back-porch folk." In addition, Rolling Stone also listed Brothers Osborne as one of 10 Artists You Need To Know. Furthermore Country Weekly listed Brothers Osborne as one of their "ONES TO WATCH IN 2014" and Paste Magazine listed the brothers on their "Best Of What's Next" list.